Once in a while I get an idea stuck in my head. This latest one is extra sticky. I want to build a car. Well, sort of a car. I’m a sucker for alternative transportation. I often wonder what our vehicle options would look like if the car as we know it suddenly disappeared. What would we build? If I had my druthers, I’d likely opt for something in between a car and a motorcycle. What I have in mind is a convergence of a lot of different ideas. Most of all, I’m looking for something that would combine the soul of a motorcycle with some of the practicality and safety of a commuter car like the Smart. The kind of vehicle I want doesn’t really exist. If it did exist, all the R&D cost it took to bring it to market would likely put it into early adopter pricing. For example, a Smart costs $12k+ just to get started. That’s pretty steep for such a basic little box of a car. There’s no soul there either. Even the Aptera is going to run the better part of $30k. I love making things. Ever since I was a little kid, I’ve wanted to build a kit car. I also have a lot of ideas around custom motorcycles and even custom scooters that I’d like to build. I love the idea of design criteria — limitations that feed creativity — something that would take me back to my engineering roots. But more than that, I want to connect to that spirit of human ingenuity that inspired folks like the Wright brothers. They were bicycle mechanics for crap’s sake! I want to build a tilting, three-wheel, streamliner commuter vehicle. For now, I’m calling it Project Streetliner. I’m not interested in developing this for market. This will be a one-off, custom vehicle designed to haul me (and only me) around from A to B with style and efficiency. I want to utilize off-the-shelf components or harvest big parts from existing vehicles so that I only have to do a minimum of actual engineering. I’m not going to even attempt to be cutting edge. This won’t be a hybrid. It won’t run on vegetable oil. But I am looking for at least 60 mpg, all while remaining highway capable — which means being able to cruise comfortably at 65 mph or more. I want something styled from bygone eras with lots of curves and even some open-cockpit WWI mojo. Also, I want to build it in public, like Craig Vetter is doing with his streamliner project — hence this website. The racing influence is a big one. Not just from a styling standpoint, but if we think about what race optimization is, it’s really the crossroads of safety and efficiency. 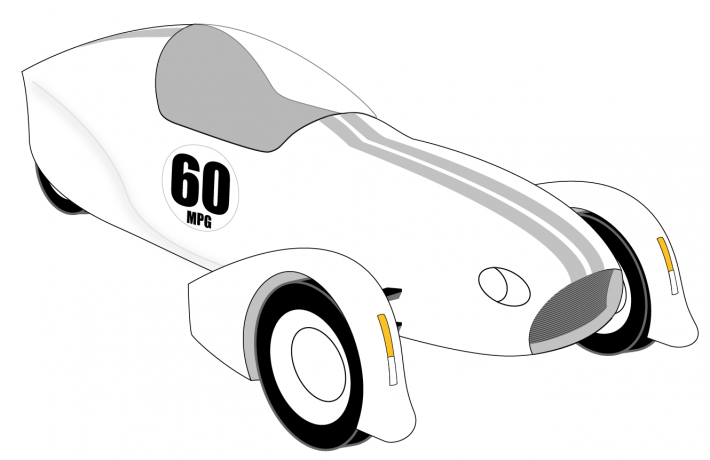 A race car is a lightweight vehicle with good aerodynamics and hefty safety considerations. Take a light chassis, add a steel safety cage, put some body work on it, then drop in a bunch of horsepower and vroom — you’ve got high speed. Take that same setup, but lower the horsepower, and you’ve got high fuel efficiency. Now we’re on to something. So this website is where that happens. I’ve already been working with clay and wood mockups of the overall shape, but I know I’ve got a lot of thinking and playing to do before any rubber meets the road. Check back for updates, or do utilize the handy RSS feed.